The continuous gentrification, rising rents and constant change in New York City is a daily, almost hourly topic of conversation for anyone who has lived in this city for some time, and it is an obsession for those of us that grew up here. This has only ratcheted up in the wake of the announced closings of Union Square Cafe and WD-50, the actual closing of Rodeo Bar and Jim Meehan of PTD fame announcing he is pulling up stakes and moving to Portland, OR. The East Village has been particularly hard hit. One of the many casualties in the East Village was Mama's Food Shop, a beloved local joint that served Fried Chicken and other Southern Food staples to the East Village for fifteen years. Its closing came with a letter from the owner decrying today's climate. Despite the tough climate and odds against success in opening a restaurant there seems to be no shortage of chefs and entrepreneurs who want to take a crack at finding success in the Big Apple. Do I need to quote Sinatra here? The only question was what would open in the old Mama's space? A 7-11? A bank? A Duane Reade? It turns out to be another restaurant. So, who is foolhardy enough to make a go of it? Two photogenic, former Top Chef contestants, Jeff McInnis and Janine Booth. The cuisine they were going with? Southern food. The name of the Restaurant? Root & Bone. Better than a Chase, but I was wary. A look at the website did not inspire confidence. The cover photo had an old pick-up truck and a meandering chicken in sepia tone. This was not a nod to the abandoned cars and backyard chickens of Avenue B in the 70s & 80s. The menu was straight out of an Eater spoof. New York has seen a proliferation of down market, southern comfort food spots with a farm to table aesthetic and possibly, some foraging thrown in. Here was yet another one. The website promised "soul nurturing," a craftsman's ethic" and "artistic culinary thought." And, my mistake, this is not Southern or Soul food. This is food from "rural America." Did I mention the place is called Root & Bone? My native skepticism was running high. Mr. McInnis and Ms.Booth have set themselves an impossibly high bar. Replacing a a local favorite is hard enough. Serving the same cuisine just adds to the pressure, and when that cuisine is becoming as common as wainscoting and reclaimed wood in restaurants you are setting yourself up for failure. The two chefs do have some bona fides. They both cooked at Yardbird, which was a James Beard Best New Restaurant, South semi-finalist and Mr. McInnis is a two time James Beard nominee for Best Chef in the South. The only chance of surviving beyond the initial hype and brunch crowds is if they can really deliver in the kitchen and separate themselves from the pack. Are we getting The Allman Brothers or Molly Hatchet? Cue Duane Allman guitar solo. To start, Root & Bone has a nice booze and cocktail list, which is mandatory these days. A good test of any restaurant is their Bloody Mary. The care taken with this brunch staple is a good indication of the attention to detail you can expect across the board. Chances are that Bloody Mary that comes with a garnish that includes and olive stuffed with a cornichon as well as a piece of bacon it will be good. To quote my official Bloody Mary expert, Karen; "Oooh. Wow. Try this." 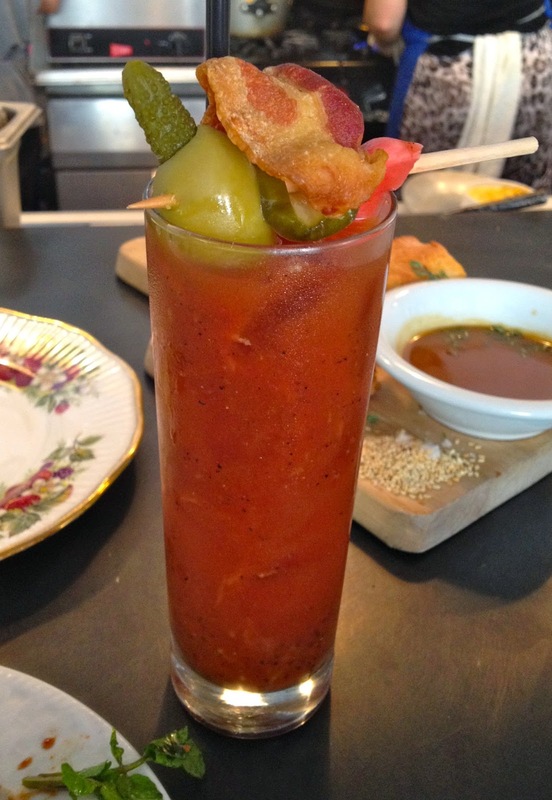 If you like a spicy & strong Bloody Mary the bar at Root & Bone has one for you. This hits all the marks promised by the restaurant. 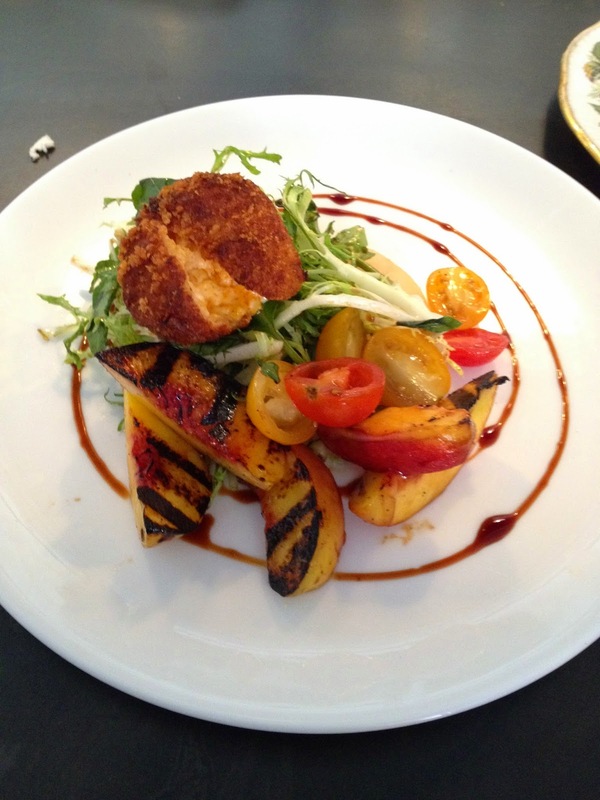 The salad is a southern riff on the classic Caprese salad. Heirloom tomatoes, at their summer peak, are joined by their southern cousin, a pickled green tomato. Grilled peaches add some summer sweetness and char and a few greens are thrown in for good measure. 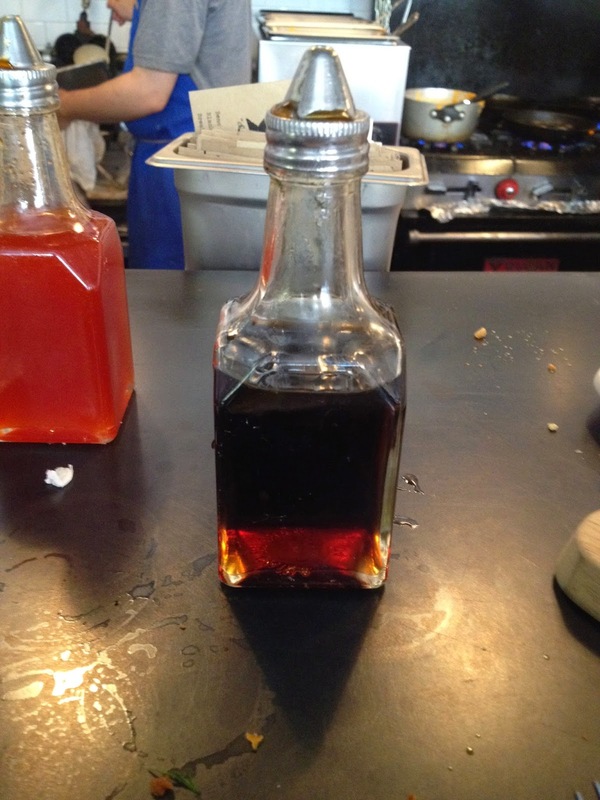 Molasses vinegar dresses the salad, another riff. In case you missed the southern touches the stand in for mozzarella is a fried ball of pimento cheese. This is a little like replacing your Fiat with the General Lee and let's be honest, we all want to take a drive with the Duke boys in the General Lee. This salad combines the high and low, the healthy and decidedly not on one plate and is flat out out delicious. 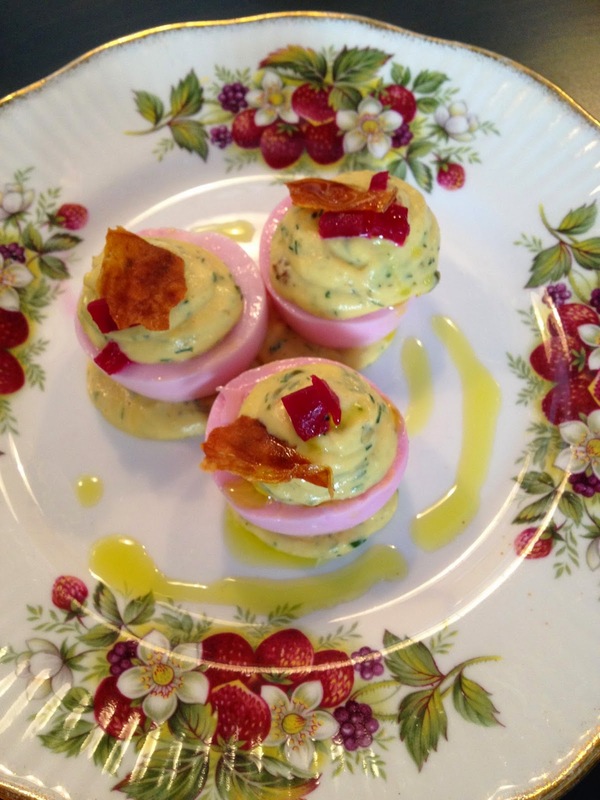 Deviled eggs are quickly becoming the new kale salad. Everyone has a version. Being a huge fan of deviled eggs I am fine with this trend. Can Root & Bone's stand out from the crowd? That is a definitive yes. The menu describes the place and pedigree of the eggs (a farm in the Catskills) along with pickled roots and sunflower sprouts. They are holding out us. The filling is a mustard delight, topped with a touch of bacon. I may have used my finger to clean the plate. Another dish that is becoming more commonplace on menus is watermelon salad. Root & Bone's watermelon salad is lightly bathed in a nicely original celery & lemonade vinaigrette. The addition of sliced radish is an inspired choice, the tart crunch of the radish complimenting the soft, sweet watermelon. This is a perfect summer dish and, like the caprese, highlighting the best produce of the season. I don't know if there really is a Grandma Daisy, but any southern joint worth its salt better deliver a good biscuit. These are fine biscuits. They are served with a honey roasted chicken jus for dipping, toasted benne seed-sea salt for sprinkling and a dash of fresh thyme. They will go quickly. 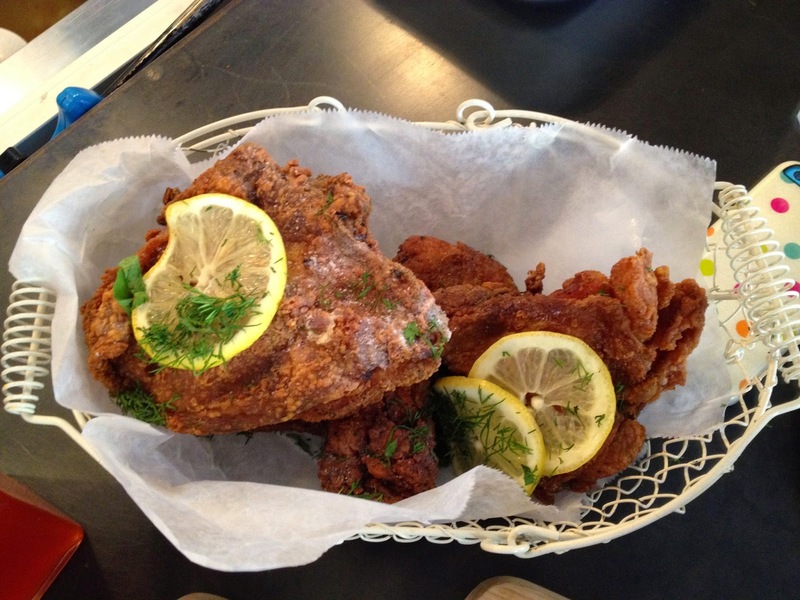 Root & Bone's signature dish is their fried chicken. This city is awash in good fried chicken. Hell, the ten block radius around Root & Bone offers everything from Bobwhite Lunch Counter's Georgia fried chicken to Momofuku's Fried Chicken dinner. Mama's signature dish was their fried chicken. Forget swinging and missing, even a solid double here is not going to cut it. This has to be a home run. The chicken is brined in sweet tea and dusted in pickled lemon and comes in two sizes, half or whole bird. It is served in a homey wire basket. This chicken is no line drive that finds the corner. It is a no doubt about it, second deck home run. It is, in a word, spectacular. Perfectly cooked, with crispy skin outside and moist, flavorful chicken inside. The quality of the bird shines through as do the ingredients. The brine and dust are no cute trick, they make this a dish to come back for, again and again. My Bloody Mary expert, who usually stops at one piece of chicken, demanded a second. No small praise. The chicken is also served with a bottle of house made spiked Tabasco Honey. It took a lot of effort not to pocket it. Grits are another staple of the southern kitchen. Root & Bone gets theirs stone ground from a mill in upstate New York. They come "loaded with love" which means cheese and bread crumbs and other goodies. They are decadent, thick and rich. You may never go back to mac and cheese after trying these. 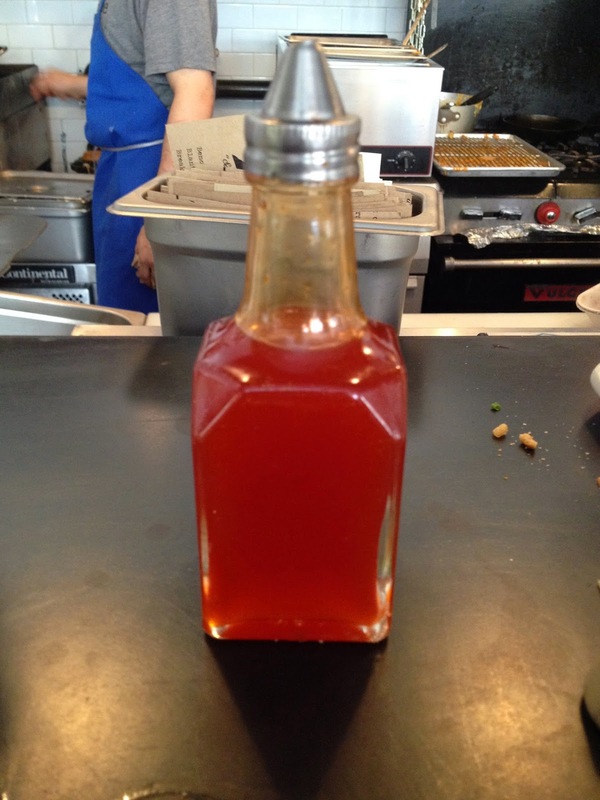 House made Whiskey Maple Syrup. Perfect for waffles, biscuits or drinking straight from the bottle. Root & Bone is not a big restaurant. You enter into a small space which houses their take out counter. A small entryway on the right leads to the first of two dining areas, both tightly packed. The design uses every possible inch for seating. Small wood tables run down the center of the first room. A part of the kitchen is in the corner of the room. It has a counter with six seats. Stools run along the windows which have an oversize sill for dining. On a warm summer day the windows are open and these seats are perfect for eating and people watching. The second dining space runs perpendicular to the first. It has banquette seating along one wall and a small bar tucked in the back with a few stools. The space is warm, painted in whites and light tans. Wood furniture and fixtures have a sun bleached, washed out feel. The large windows on the street make the rooms feel bigger than they are. On our visit we sat at the counter in front of the open kitchen. We had a full view of the kitchen and staff at work. If you are under the belief that the life of a chef is a glamorous one, especially for those who have been on Top Chef, spend an hour at Root & Bone during prime Sunday brunch. This is hard, hard work. The place was jammed. Chef McInnis was directing traffic, calling out orders, checking dishes, tables, calling for water bottles to be filled and having kitchen staff deliver food to tables. An hour earlier one of the restaurant speakers had fallen off the wall and directly onto his head, nearly knocking him out. Chef Booth was one of three in the tiny open kitchen, working at one stove, making Shrimp & Grits, Braised Short Rib Meat Loaf (both of which I plan on coming back to try) and a number of other dishes as the orders kept rolling in. Before we finished our meal the credit card machine system went down. Chef McInnis personally apologized, embarrassed to ask us if we could pay in cash. A month old and still working out the kinks. This is reality when you own and run a restaurant. 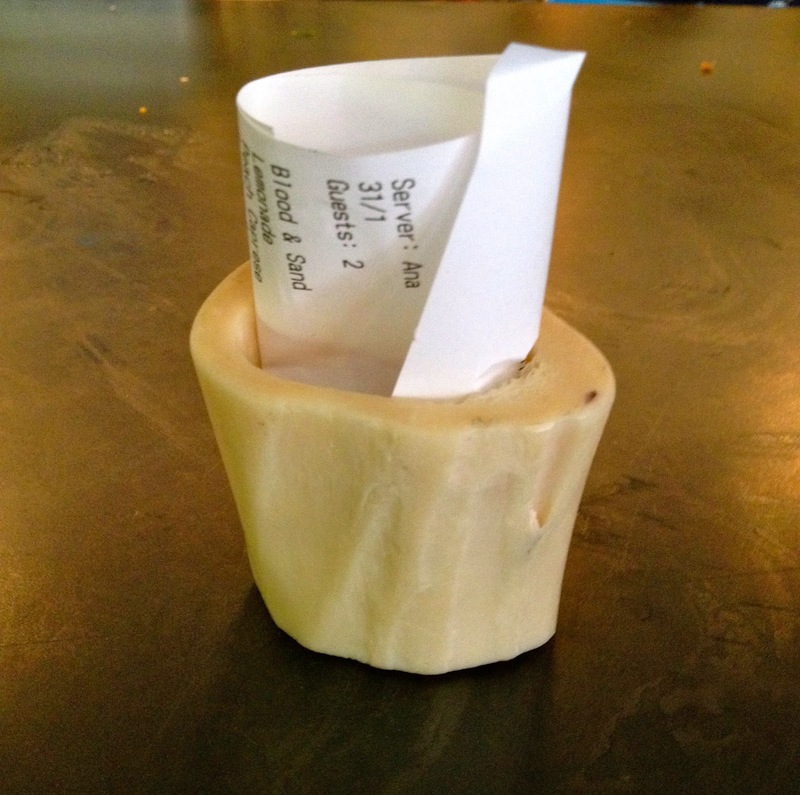 The check, delivered in a namesake bone. I will return to Root & Bone. I will return for the food and drinks, which are top notch. I will return in particular for the Bucket of Bird, my new favorite fried chicken. I will also return because I am rooting for them to succeed. So go, eat, enjoy and support these fools that left Miami to open a small restaurant on 3rd Steet and Avenue B. This is a tough town. I hope they win and can play Frank's version of "New York, New York" at the end of the night. I hope these restaurant has made it all through out these years. Their meals looks delicious and satisfying, worth sharing via can you write my essay. Hello Guys, Here we are going to provide you the best portal for play fireboy and watergirl free online games ans these games are challenging games. You access to these games online without facing any type of problem or hurdle and these games are available in the best quality. These games are played with the help of keys as Fireboy is played with the help of Arrow keys and Water girl is played with the AWD keys. Once go for these games. I like your all recipes and it so easy to understand. I will definitely try it. I love this kind of foods. thanks for share with us. I shared your recipe on my blog happy columbus day & pictures of christopher columbus. They say that Dubai is a city in the middle of the deserts. However, the city has come a long way to be one of the most developed cities in the world. Currently, Dubai essay on time has the most respected engineers and businessmen around the globe. Besides, its infrastructure, presently, is something I believe you don’t want to mention. This is a really nice post. I agree with this post. Thank you for sharing this. If you get a printer, do not reply to the Troubleshooter and see it. Make sure you use the latest version of Machine Development Plan err_cache_miss-error. Amazing blog and thanks for sharing this recipe. I really like your blog, thnx for sharing this amazing recipe.